Ultra-Clear is a new and exciting Optical Quality Tempered Glass with Exceptional Clarity and High Light Transmission, with No Color Distortion. The Exceptionally High Light Transmittance and Lack of Distortion in the Ultra-Clear Lens Maximizes the Light available for Improved Visual Acuity, especially Underwater in Low Light Conditions, Better Vision, Truer Colors is what you get with Atomic Aquatics Ultra-Clear Lens. The Atomic Aquatics Frameless Mask has a Double Feathered Edge Skirt that provides an Excellent Seal on the Divers Face with an Easy-to-Reach One-Handed Nose Well for Ear Equalization. The Wide Split Style Mask Strap Increases the Masks ability to conform to your Face adding to its great Sealing Ability. 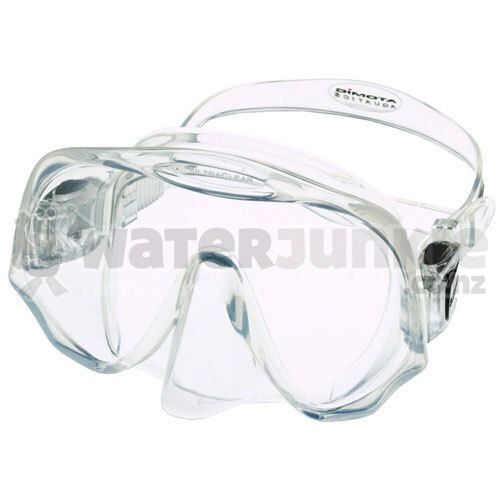 The Mask is available in 2 sizes of Regular and Medium (for narrow faces) to fit most divers' faces. The Atomic Aquatics Frameless Mask comes 3 color choices in Black, Pink or Purple. All come with a Clear Silicone Rubber Mask Skirt and Strap. The Atomic Frameless Mask is so durable it carries a Limited Lifetime Warranty! Mask also comes with a Mask Box.